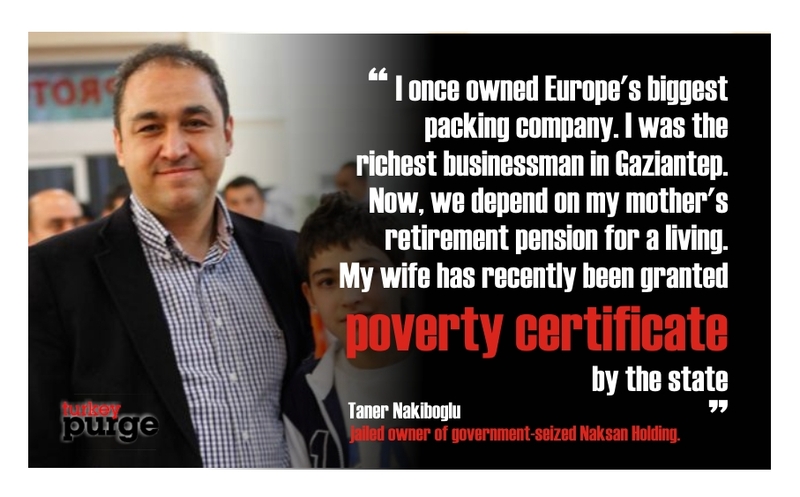 Taner Nakıboğlu, the owner of government-seized Naksan Holding, a Turkey-based packing company, said during a hearing on Tuesday that before his company was confiscated, he was the richest businessmen in Gaziantep province; yet his family now lives on the breadline. “I once owned Europe’s biggest packing company. And I was the richest businessman in Gaziantep. We have not hidden money neither in Turkey nor abroad. Now, we depend on my mother’s retirement pension for a living. My wife has recently been granted poverty certificate by the state,” Nakıboğlu said during a hearing in which he is being tried on terror charges. Since a coup attempt on July 15, 2016, the Turkish government has been taking over the private property of non-loyalist businesspeople without due process on unsubstantiated charges of terrorist links. Naksan holding was seized by the Turkish gov’t only several days after the coup attempt. The owners of the holding, Taner Nakıboğlu and Cahit Nakıboğlu were arrested by a Gaziantep court and put in pre-trial detention over alleged links to Turkey’s Gülen group, which the Turkish government accuses of masterminding the coup attempt. A total of 527 companies have been transferred to the state-run Savings Deposit Insurance Fund (TMSF) since a July 15 coup attempt in Turkey, Deputy Prime Minister Nurettin Canikli told reporters in November of last year. “Two hundred seventy-one of them are subsidiaries of nine large conglomerates,” Canikli said, adding that the government has confiscated 30 such holdings in total since July 15. Among the large conglomerates that have been recently confiscated by the TMSF are Koza-İpek Holding, Boydak Holding, Dumankaya Holding, Kaynak Holding and Naksan Holding. The companies are alleged to be connected to the Gülen group, which the Turkish government accuses of masterminding a coup attempt. Akın İpek, the CEO of Koza-İpek holding until the confiscation, said 18 of the group’s confiscated companies alone worth over $10 billion. The government’s crackdown against the group, however, is not limited to the period following the coup attempt since the management of many institutions affiliated with the movement had already been seized by the TMSF over the course of the past three years. Minister for Environment and Urbanization Mehmet Özhaseki said on Sept. 1 that some TL 12 billion (about $4 billion) in property had been transferred to the Treasury as part of an investigation into the group.